How do I share grouping responsibilities with my team? After you and your team complete the private brainstorming step of the retrospective, you'll be able to review everyone's topics and group together like items into themes. You can also give those themes a title to capture the collective thought behind the group. Whether a retrospective is live or distributed, the energy of the room can sometimes drop during this process, lowering engagement and making this part of the retrospective seem unnecessarily long. To create more engagement you can share the grouping responsibilities with others in your Team Room. The facilitator (outlined in grey) of the retrospective starts out with grouping responsibilities, but can easily give it to someone else using the easy-to-understand controls in the side navigation panel. 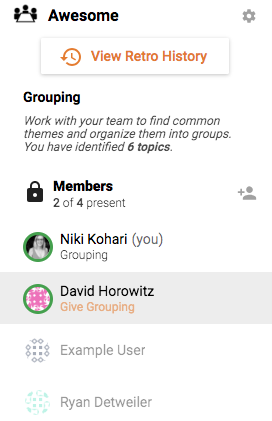 In this example, David is still the facilitator, but can pass grouping to Niki. The new person can then group as many items as they need to by using their mouse to drag similar notes into stacks.